Now that we know all the juice details about the Disney+ streaming service, it suddenly feels like it's closer than ever, and not just because Disney has finally announced a release date. We have confirmed info on the platform's list of original shows and movies, subscription fee, and more, including fresh images of what it'll actually look like when beamed onto our televisions, smartphones, and consoles. Following its Investor Day presentation, Disney's info-dump about the Disney+ streaming service is so comprehensive, that it can be hard to take it all in without feeling overwhelmed. Luckily for you, we've compiled all the easily digestible highlights and crucial info about Disney+ that you need to know into one article, which includes the full list of original content slated to hit the platform in its first year and beyond. Read on, Disney fans, to find out about your next favourite streaming service. The good news is that Disney+ is coming this year! November 12, 2019, in fact, at least in the United States. While Disney hasn't announced when other regions can expect to see the service hit their device of choice, the company has affirmed its “plans to be in nearly all major regions of the world within the next two years", so that gives you an idea of the platform's schedule beyond the United States. The better news is that Disney already has a subscription service in the UK, DisneyLife, which gives subscribers access to 450+ Disney movies for £4.99 a month, but there’s no word on whether Disney+ will replace this or not. Even so, UK Disney fans can subscribe to this in the meantime while they wait for its natural successor. The Disney+ streaming service price will cost US subscribers a grand total of $6.99 per month, or $70 for an annual subscription (saving you around $14 compared to the rolling rate). This undercuts the current Netflix US subscription fee by nearly half, so it's fair to say that Disney is coming out fighting. Again, we still don't know what the equivalent rates will be for subscribers outside the US, though given that Netflix UK users are currently paying between £6 - £10 a month, we can estimate that Disney+ could float around the £5 mark in that region. It all depends, of course, on when the service releases internationally, and the current market trends of that time. Disney+ streaming service movies and TV shows - what will I be able to watch? This is the most important question, right? What's the point of paying for a streaming service if it doesn't have some of the best exclusive slate of shows and movies available? There are a lot of rumours flying around about some of the content that will appear on the Disney+ streaming service and while plenty has already been confirmed (we’ll get to those in a minute), there are more than a few unconfirmed rumours flying about as well. What about the Netflix-Marvel shows? It’s also worth talking about the Netflix-Marvel TV shows. Daredevil, Jessica Jones, Luke Cage, Iron Fist, and The Punisher (and by default The Defenders) have all been cancelled now - although we will still be getting Jessica Jones season 3 later this year. While most fans assumed this was down to Disney not wanting any more Marvel TV shows on any other streaming service, Marvel TV head Jeph Loeb released a letter to the fans after the most recent cancellation implying the decision was entirely down to Netflix. “Our Network partner may have decided they no longer want to continue telling the tales of these great characters,” the statement reads. “But you know Marvel better than that.” This certainly seems to imply that there might be a place for these shows on Disney+, while Marvel Studios head honcho Kevin Feige has already promised that the streaming service's new Marvel shows will be "entirely interwoven with both the current MCU, the past MCU, and the future of the MCU", which might come as small comfort to those who always wondered why Netflix's heroes were so removed from the events of their big screen counterparts. When asked about the return of The Defenders by THR, new head of Disney+ Kevin Mayer, said: “They are very high-quality shows. We haven’t yet discussed that, but I would say that’s a possibility.” However, some reports suggest that the Disney+ streaming service won’t feature anything harder than a PG-13 rating and the Netflix-Marvel TV shows are rated TV-MA (the TV equivalent of an R-rated movie). Some have suggested that Hulu - which is partly owned by Disney - would be a better place for these series, and Hulu’s Senior Vice President of Originals Craig Erwich said “Marvel has a ton of titles we’d be interested in,” when asked by TheWrap if Hulu would be interested in reviving one of the Netflix-Marvel series, adding: “It kind of just depends on when they’re ready, [and] who, most importantly, is going to be behind these things.” For now, we just don’t know if the Netflix-Marvel TV universe will move to Disney+. Will there be any Disney+ original movies? Disney has announced that every single Pixar and Star Wars film in existence will be available on Disney+ from day one, including the former's portfolio of famous theatrical shorts. What's more, the company also intends to bring all of its MCU movies to to the streaming service too, beginning with Captain Marvel on release day. But Disney's back catalogue extends well beyond the realm of Jedi and superheroes, so what about its library of classic animated movies and shows? The entertainment titan has confirmed that users "will be able to rediscover more than 7,500 episodes and 500 films" in the first year of the service's rollout, with more content continually added from there on, but hasn't specified the exact titles included in that number. More interestingly, Disney's recent acquisition of the FOX entertainment brand means Disney+ will be the home of several brands previously attached to cable TV, including all 30 seasons of The Simpsons. Other FOX properties like Malcom in the Middle, The Sound of Music, and The Princess Bride have been confirmed, while "over 7,500 television episodes and 500 films including blockbuster hits from 2019 and beyond" are being promised as a result of this buyout. We likely won't find out about every available show and movie until get to scroll through the digital halls of Disney+ for ourselves but, rest assured, there'll be plenty to dig into from day one. Disney+ streaming service design - what will it look like? Disney recently showed off an early prototype of the Disney+ user interface, and it's looking as sleek and majestic as you'd expect from the company that pretty much owns the entertainment industry at this point. 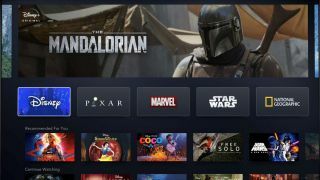 As seen in the image above, the Disney+ platform will feature "dedicated immersive branded tiles and dedicated pages for Disney, Pixar, Marvel, Star Wars and National Geographic" designed to make it easier for users to watch what they want, while we've been promised the ability to customise our accounts with unique avatars and curated content catered to our specific interests. Meanwhile, Disney has expressed its aims to bring Disney+ to every available platform, including mobile devices and consoles like the PS4, Xbox One, and Nintendo Switch, with the streaming software built to provide the optimal viewing experience suited to each piece of hardware. Speaking of, 4K HDR playback will be supported by Disney+, and you'll even be able to download content to view it offline at a later time; perfect for those daily commutes to work. Disney+ streaming service app - will it have one? There’s also going to be a Disney+ streaming service app, which, interestingly, will serve five different versions to users based on their particular interests. “We’re going to superserve fans” of various brands, Iger said, implying that the actual window-dressing of the app - not just the content - will be different depending on what the user is interested in. This is fairly different to most other streaming service right now, as, although each attempts to serve customised content to its users, most platforms (on app or otherwise) have a unifying look. You can keep up-to-date on any new announcements about the Disney+ streaming service by sign up to its mailing list. While you wait for Disney+, check out the best movies on Netflix to watch on the current champion of streaming services in the meantime, or play the video below for a bitesize guide to the top 10.